Dear Fuki! It was such a cute Furoshiki workshop. Colorful wrapping with Furoshiki will make people happy and excited reminding its sender’s hospitality. Thank you for the report! I think our first round of blog relay by variety of authors turned out to be quite successful. Now it’s my turn to write from Tokyo! 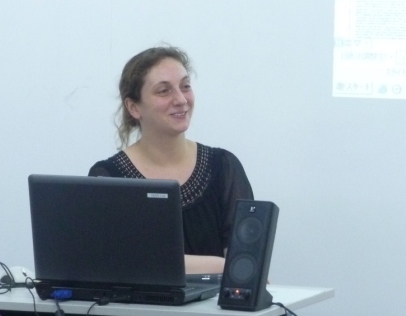 The lady in the picture is Ms. Katja CENTONZE, a researcher from Italy staying in Japan for almost one year as our Japanese Studies fellow. She has been researching on Body theories of Butoh in the Tsubouchi Memorial Theatre Museum, Waseda University. 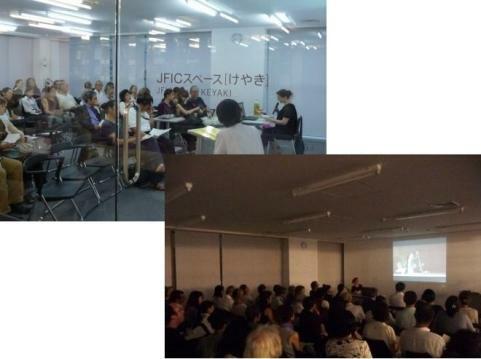 At the end of her fellowship period, she held a small seminar in JFIC and was joined by many audiences interested in the world of Butoh. This is the report of her seminar. It is very difficult to explain the difference between "Shintai" and "Nikutai", two different words, both meaning "body" in English, especially in relation to Butoh. What made you choose this theme? ―It is a very complicated idea indeed but that’s what fascinated me. To what extent can the analysis concerning Shintai and Nikutai be deepened? Now I know that it is a never ending research…! ―During my stay in Japan, I was involved in the project of reading Hijikata Tatsumi’s work "Yameru Maihime" in Akita dialect. And also I took part as a member of the jury in the New Figures Festival Die Pratze "Dansu ga mitai!8 (I wanna see Dance! 8)". 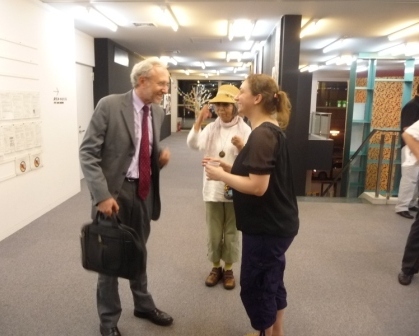 There was a lot of opportunities in Japan to explore my interests and experiences even beyond my research. I was blessed to make an acquaintance with kind friends through these events. ―I love performing arts in general and when I started studying Japanese language at University Ca'Foscari, Venezia, I chose Butoh as my theme. Butoh is often mentioned as Anti-Dance. There is a performance in which a performer merely stands still for 20-30minutes. But the body of the performer still captures the attention of the audience and we are somehow forced to see him. It is through his body that we see the senary. Very, very interesting. After the seminar she was surrounded by her friends one after another. It seems that she has spent a fruitful time in Japan and succeeded in her research. Katja-san, thank you very much for your time! We wish you all the best in your professional and private life, and we look forward to seeing you again! The next author is Any in Moscow! How is the atmosphere in the town?